EDIT: I am playing in the normal Career mode, not FMC. I'm just using a skin which makes it look like the Classic mode. I enjoyed these last time out, so will be eager to try this out as I doubt anyone will be able to seriously challenge for the title. Should be a fun one! Good luck managing in Bulgaria. Tough draw in the Champions League though, Legia could be a tough test. My first game of my new job at Torpedo was on the very day that I signed, so basically no time to meet the players or anything, mental! Away to Sibir Novosibirsk, we took the lead three times and were pegged back each time. Not much to say really, I pretty much just let the game run by as I had no idea who my players were! The next game against Sokol Saratov also came a little too soon, as we got beat 2-0. Their first goal was undoubtedly offside and things went downhill from there. A home clash with Vityaz Podolsk followed. We weren't quite firing on all cylinders against the relegation threatened side, but we ran out 2-0 winners regardless. A good result, and my first win at Torpedo. Another home game, again against relegation troubled Khimki this time around. 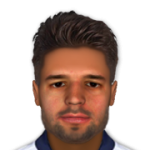 We were on fire, with Alexandr Prudnikov becoming a firm favourite of mine up front. Our final game before the winter break was away to Baltika Kaliningrad. A slightly subdued performance, however a questionable penalty awarded to us was converted just before the break. They scored a penalty of their own just after the hour mark, but that man Prudnikov popped up with a winner with a quarter of an hour left to play. A solid first few games in charge. Once the players began getting on board with the formation and the high pressing & high tempo style of play, our results and performances improved. Unfortunately they have all buggered off on their mid-season holidays, so we will continue our training preperations after they return in mid-February. I will be taking the time in the mid-season break to improve the scouting and coaching. Unfortunately, there is some sort of 'Salary Commitment Cap' in place where I can only spend a maximum of £56,000pw on player wages, so there will likely be no transfers in the winter window, aside from a few youth players who I have scouted and will be joining shortly. Those will be included in the March 2016 update. October 2015 - I'm back in business baby! 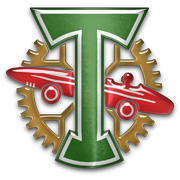 Having been relegated from the Russian Premier League during the 2014-15 season, Torpedo Moscow are currently in the Russian First Division. They are currently sitting 4th after 17 games, exactly half-way through the season. I have signed a 2-year contract, with the aim this season to at least reach the Playoffs, where we currently sit. 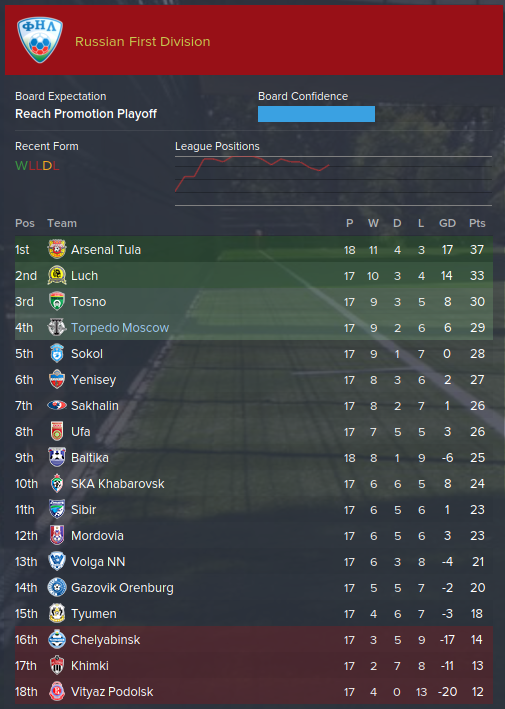 Ideally though, I would like to try and push for an automatic promotion. We have a large (I think...) wage budget of £120,000pw, while we are only spending £52,000pw. This gives me a lot of flexibility to improve the squad, which is great. I will condense the next update into a large one where I detail the squad, tactics and both October and November fixtures. We then head into a Russian Winter [Break], where I will hopefully be able to strengthen the team during February (Russian Transfer Window) and push for promotion into 2016! A good season to begin the story. 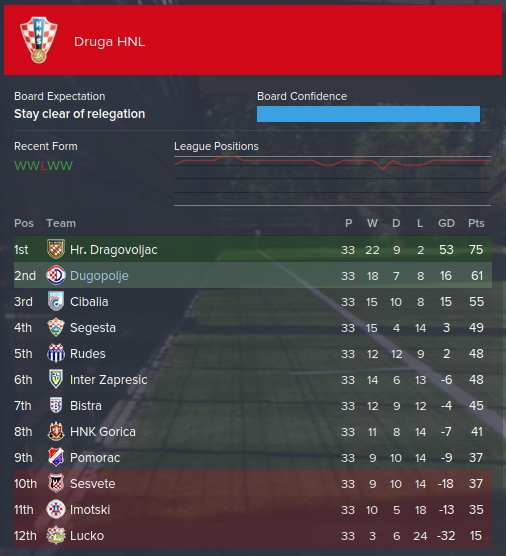 The league was never a possibility, with Dragovoljac a clear level higher than everyone else in the division. I must be honest however, and state that I doubt this squad has much capability to grow, especially as Hadjuk cut our affiliation, and the board are unwilling to find another parent club. Other issues, such as a decreased wage-budget from £11,250pw to £9,500pw has dented my confidence in the board. As such, I have decided to resign from the job. A disappointing game for sure. We started off the brighter, having a goal [rightly] ruled out for offside after just 6 minutes. We eventually took the lead in the tie with a Jure Gale header from a corner. 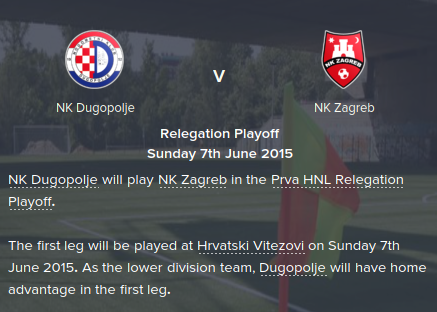 NK Zagreb came back quickly however, and were level 10 minutes later. They continued to press and were in front 7 minutes later. We valiantly tried to get back into it 2nd half, but Zagreb controlled possesion well, and we were unable to break them down. A very tight game, with neither side really wanting to make a mistake and remaining quite reserved. We scored late into injury time of the first half with a nice counter-attack from a NK Zagreb corner. Antonio Simunovic, playing as the Advanced Forward, with a smart finish into the bottom corner of the goal following a long pass from Filip Scrbec. A slightly more open second half followed, with both sides having a fair few chances, but little quality in finishing. Zagreb got a lucky, but probably deserved, equaliser just 3 minutes from time. It's left us with it all to do in the away leg in 3 days time. 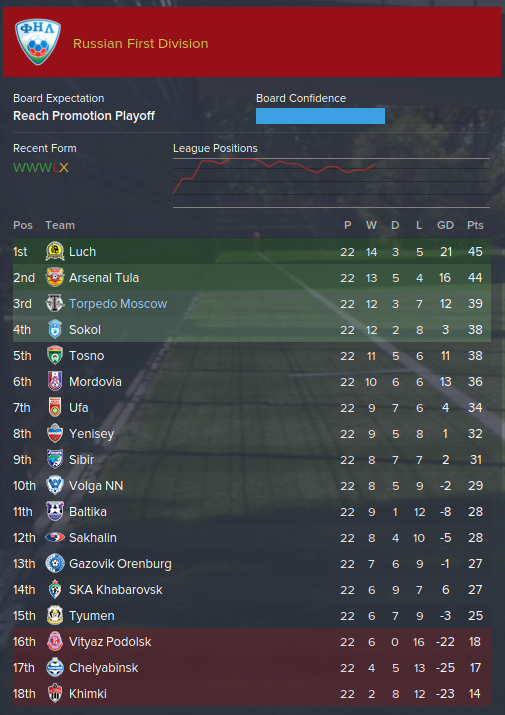 Going into the final month of the season, we were hopeful of maintaining our Play-Off place. A tough away trip to Cibalia was made easier by 2 comical own goals which ultimately were the difference between the two sides. A quick nod to Filip Scrbec, who has become arguably our most effective player on the left-wing or playing just behind the striker (usually Tino Lagator). Next up was a home game against the League Winners in-waiting Dragovoljac. I adopted a slightly more defensive outlook, keeping just Lagator up front, with Scrbec and Tomas ready to support on the counter. It worked more or less, as they were unable to force their way through, and we nabbed the win in the final minutes from a corner kick, with January signing Stipe Dodig heading home to earn another valuable 3 points. Going into the game against Rudes, a win would have guaranteed us 2nd place. Unfortunately, we struggled in a fairly even game. A goal conceded with 20 minutes left to go was hard to take. We ended the month with 2 games against Imotski and Sesvete. Both teams were in the relegation places, and we firmly beat them both, relegating both of them, to secure 2nd. I am reasonably confident. We have been in good form and confidence is high as we have exceeded expectations quite a bit (Avoid Relegation). We will play them over 2 legs. I'll post an update after each match. Gutted for you there. To lose is one thing, but to lose in that fashion is particularly hard to take. Our first game of April came against HNK Gorica. Three early goals pretty much wrapped up the game, with Gorica looking a little shellshocked. The remainder of the game was pretty uneventful, but we were in control. Very happy with the clean-sheet. We then went to Bistra, where we promptly got beat 3-0. The scoreline flattered them a little bit, as they actually only had 6 shots all game. We had 11, 7 of which were on target, but we were unable to beat the keeper who won MotM honours. Another away day, against out-of-form Pomorac. A shoddy first-half was contrasted with a good second, where we converted a dubious penalty, before scoring 10 and 20 minutes later to secure the win. A late consolation from Pomorac was too little, too late. Next were Segesta, who we were level on points with during the time we played them. We pretty convincingly won, although I will be honest and say that the scoreline definitely flattered us a bit. Heading away to league whipping-boys Lucko, we were already consigned to relegation at this point, came at a nice time where we had been scoring well and were doing OK. We made hard work of it though, and were level until the 90+1 minute, before Balic and Scrbec decided to make the scoreline a more true reflection of the game. The final game of the month was at home against Inter Zapresic. A game with virtually no decent chances for either side rather boringly ended 0-0. A decent month here. We have put ourselves in a firm position to take that Promotion Play-Off place, with 4 points seperating us from 3rd placed Segesta. So, here are the final games of our season. 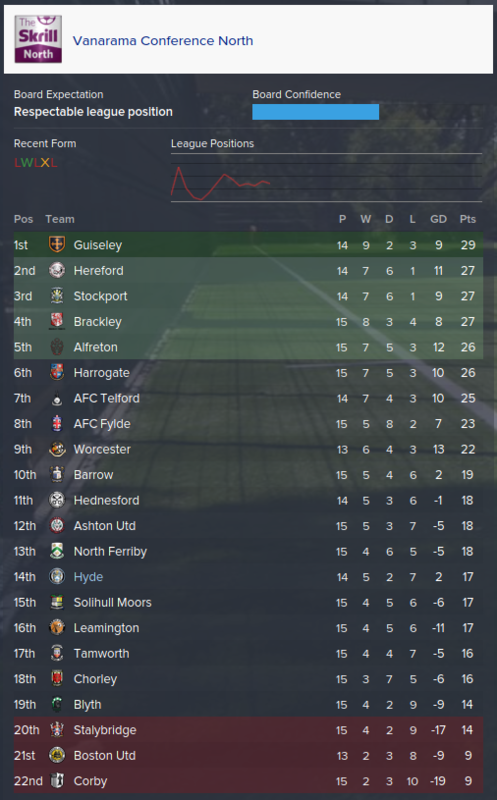 Can we secure the Promotion Play-Off place? First up after the Winter break were Cibalia. 1-0 down at HT, the boys got the old hairdryer treatment and it seemed to work. We were 2-1 up quickly, and kept our nerve to hold onto the win. We nabbed a late goal from debutante Scrbec too, which is always nice. Next were the league leaders Dragovoljac away from home, a tough ask. We just about held in there and came away with a credible point. We could have won the game, but we also very well could have lost it. I'll take the point. 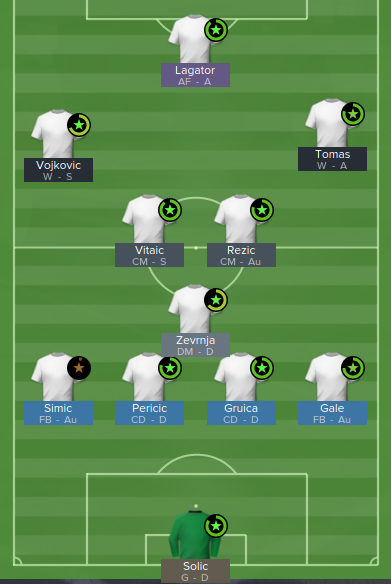 Imotski came at a slightly poor time as a few key players suffered injuries in training (Calm it down lads!) and we were forced to hand debut's to 3 youth team players. We predictably struggled and lost 2-0. Next we were back home against Rudes, who had pumped 7 past us last time out. We help a fair bit firmer this time, leading the game from the 35th minute before conceding a goal in the 5th minute of injury time in the 2nd half. Gutted. A bore-draw against Sesvete followed. We had 15 shots, and just 1 of them was on target. *sigh*. 6 points from 5 games. Not great really. At least the break allowed us to work on our defensive ability, with only 4 goals conceded. On the other hand, we looked like we forgot our shooting boots and scored just 4 too. We are still 2nd. 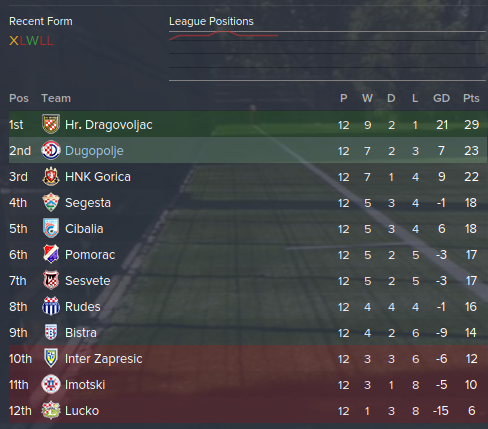 It seems everyone else is just as inconsistent and unpredictable as us, aside from Dragovoljac who are now 13 points clear at the top. A month or so back, I knew Austria Wien were interested in Vojkovic. On the 25th of January, they made an initial offer of £50k with a further £150k of a whole load of addons and bonuses. I rebuffed with an offer of £100k upfront, and a further £400k worth of bonuses. I expected them to decline and withdraw, but they actually agreed!?! For some reason, we got nearly £300k straight away, and a few clauses are still there such as Apps and Monthly Payments. As we are in financial troubles, I only ended up getting around £100k. But not to worry! 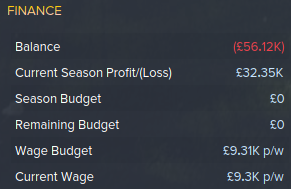 I assigned a little bit to the wage budget, topping it up to £11k a week (from £9k pw). After that was done, I went about signing some new players with our new-found wealth! Signed on loan till the end of the season from parent club Hajduk. Pretty much just to provide some cover at CB, especially as he is costing us nothing in wages. My new DM since Zevrnja wasn't cutting it, and Gale is mainly playing RB now. Will be deployed as the Anchor-Man behind the middle 2. Decent physical stats and some good other stats. Replacement for Vojkovic. 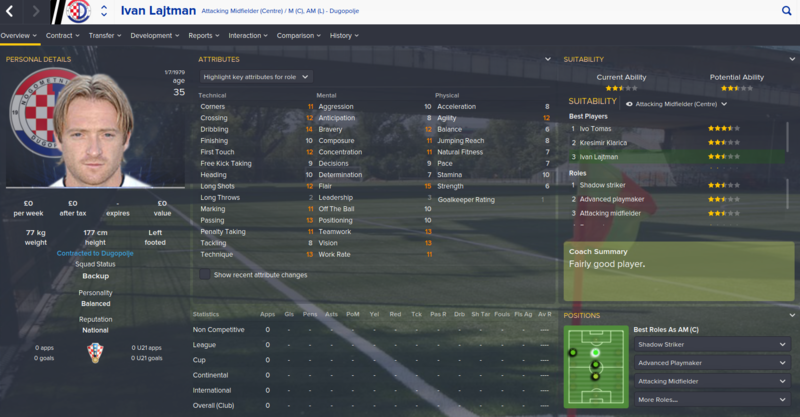 Will probably drop the left winger back to a left mid and play an asymmetric formation, or at least try it out! Cheap, young defensive cover at right-back. On a non-contract so not costing us anything. Another bit of cover in midfield. Again, another non-contract so no real problems here. Not too concerned really. Just getting match fitness up and trying out the new formation. Great 2-legged win over AS Monaco. I always feel that winning the Europa League is a rite of passage for up-and-coming teams in FM, so I hope you beat Roma! I've never managed in Iceland before, so this will be interesting. Best of luck! The first 2 months looked like it was going to be a 2 horse race but that was a horrid month.These things happen in this alternate existence we all love and biggest problem is when that morale goes in your squad its very hard to get it back.Hope you do mate. It really knocked the morale out, especially as we then got hounded 7-2 the very next game. Hopefully the Winter Break will allow us to get back on track and try and keep 2nd place at best. A mixed month here. A decent performance against HNK Gorica for 80 minutes, but 2 late goals left us with just a point from a game we really should have won. Pomorac were next up, and probably our best performance of the season was rewarded with a 3-1 win. An early penalty and another header from Lagator took us 2-0 up before HT. An early goal for Pomorac in the 2nd half put the game back in the balance, but another goal from Tomas secured the win. A shocking game against Segesta followed. I don't even know what happened. We were just shocking and seemed to concede with every shot they had. 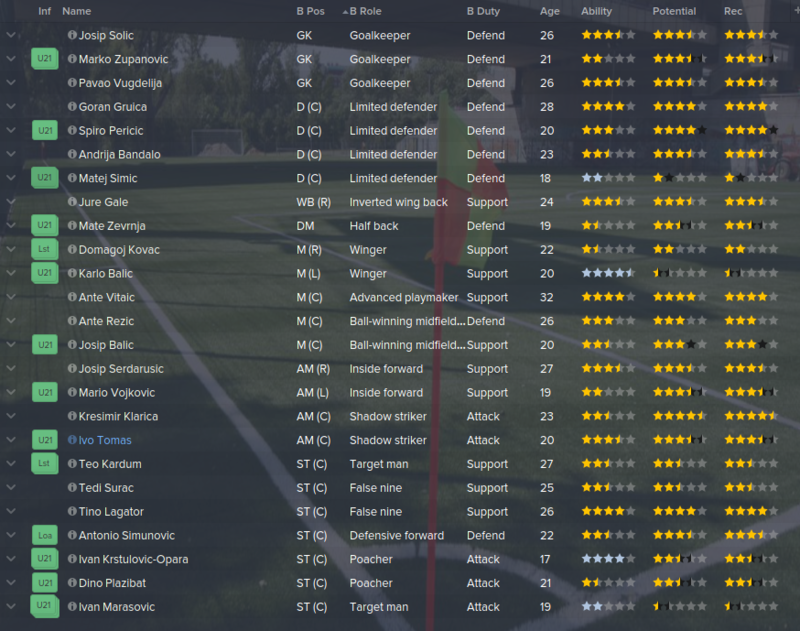 Another tough away game against Inter Zapresic, and another loss. Arguably the better team for much of the game, we levelled the game with 10 minutes left. A late penalty for Zapresic consigned us to a 2-1 defeat. To round off the month, we welcomed Lucko, and a resoundingly boring game was eventually brought to life with a great volley from Ivo Tomas in the last few minutes. Still 2nd in the table somehow. 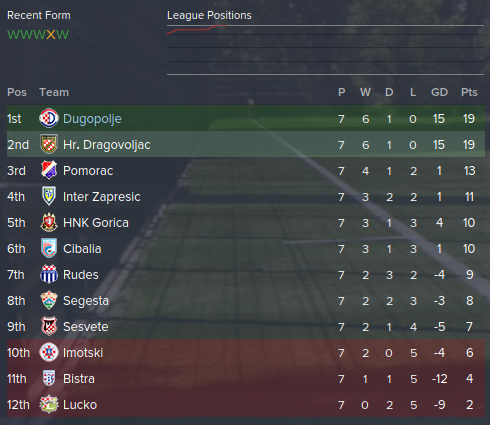 Dragovoljac pretty much have the league sown up, so it's a battle (or at least I hope it will be) for 2nd. We now head into the winter-break, so next update will be from the friendlies and any transfers before we begin back in the league. Well, our decent unbeaten start came to a very abrupt end! Just atrocious in both the game against Dragovoljac and Rudes (who had only scored 4 goals all season when we played them!). Back to winning ways against Imotski, who were poor and we really could have had 5 or 6 on another day. A suprising defeat to Sesvete. The front 3 had a terrible game and we had just 2 shots on target. Poor game all around really. 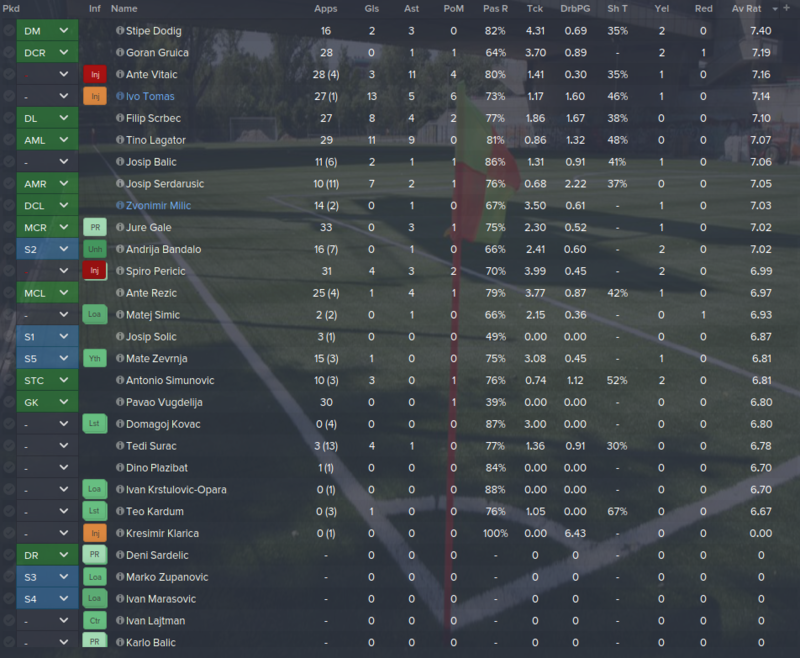 Finally, a 2-2 draw with Bistra, who we destroyed 5-1 last time out. A draw probably a fair result though. I'm not too disappoitned though. Our early season form proved we can hack it and we just need to sharpen up a little and get back to winning ways. Another fantastic month. 3 wins from 3! 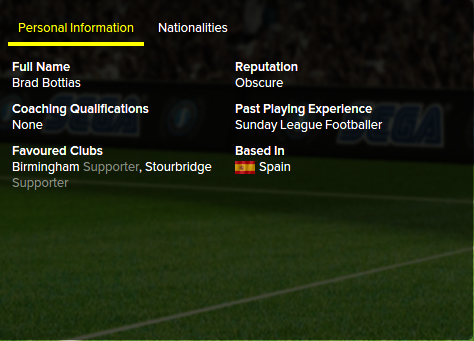 You'd be easily fooled to believe I am a competent manager, eh? A tie against 11th placed Lucko to open September. An early goal from on-loan winger Ivo Tomas proved to be the difference between 2 teams that were fairly evenly matched on the pitch. A home game against Inter Zapresic was next up, and a superb hatrick from Ivo Tomas earned us a deserved win. Target-man Tino Lagator scored a banging header from outside the box early on. Goal of the Month contender! Finally, 4th place Cibalia were our final opponents of a three fixture September. Yet another 13th minute goal (We score a lot during the first 15-20 minutes!) put us ahead before they came back with a lucky goal in the 72nd minute. 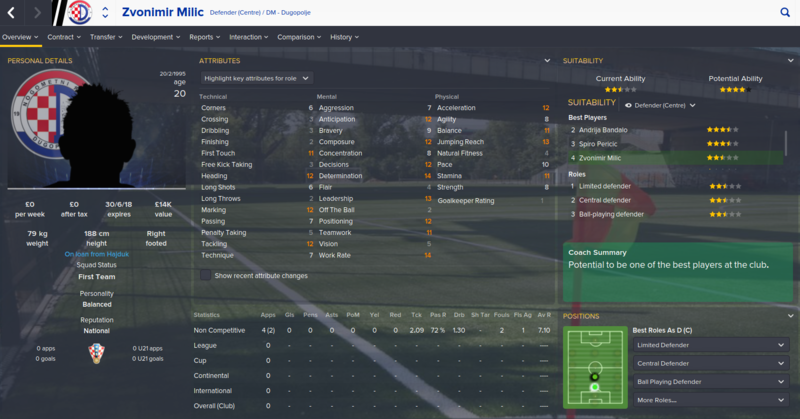 However temporary left-back Spiro Pericic scored a great header with 10 minutes left to cap off another win. Top of the table by virtue of goals-scored. A great first few games to the season. Undefeated and looking better each game. Next up are Dragovoljac too! Well, what a start to the season that was! A slightly nervy win over HNK Gornica where we were under pressure at 2-1 up, but a penalty towards the end sealed an opening day victory. No such nerves away to Bistra. 4-0 up by half-time and sailing. They scored an early goal in the 2nd half, but a penalty 12 minutes from time secured an emphatic 5-1 away win. Yet again, another dominant performance away to Pomorac. A tight first half, however they were reduced to 10-men just before the break after a second-yellow for one of their centre-halves. We turned up the pressure 2nd-half and increased the tempo. This worked quicker than I anticipated, as we banged in 5 as they struggled to cope with our high tempo with a man down. Our final game of the month saw us welcome 4th placed Segesta. An early lead from winger Mario Vojkovic was cancelled out just 2 minutes later as they drew level. They scored again just after the break, as their 5-man midfield was overrunning us and they were dominating in the midfield. A switch to a 3-5-2 in the last 20 minutes saw us grab a deserved equaliser. We couldn't quite get another goal, but I will take the point! 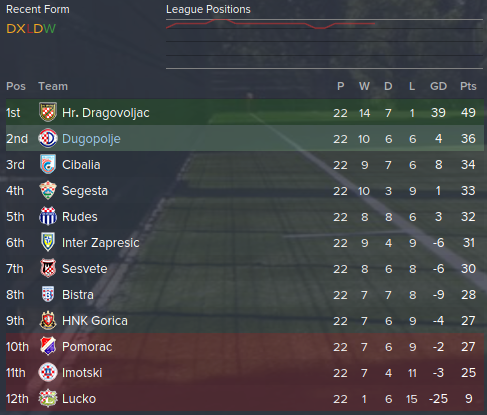 Sitting nicely in 2nd place behind Hrvatski Dragovoljac who went slightly better than us with 4 wins from 4. Hopefully we can continue this form for a little while longer! Gendo - Tell me about it! Simic actually did OK during pre-season, so we'll have to see how it goes. I do worry though. SBR - I just hope they can do alright until I get another chance to improve in those areas! A fairly standard pre-season, with 3 wins, 3 draws and 2 defeats. The players seem on board with the 4-1-2-2-1 V already, and with a little more time and fine-tuning, I have high hopes for the season. So I couldn't shift anybody out of the club, couldn't get anyone decent in on loan, and I have no wage budget to pick up some free agents. Just going to have to manage until January before we can get some fresh blood in. I especially worry about my left-back problem. First, a look at the squad. A young squad with only one player over 28. A few too many strikers, so will look to move on a few in order to bring in some much needed quality in defence, especially at left-back. 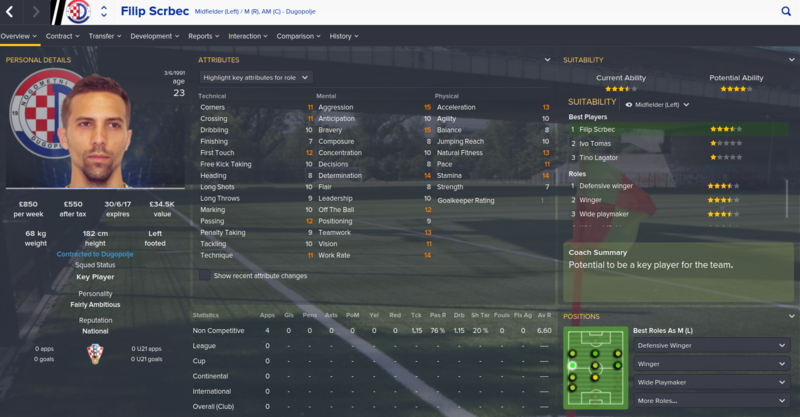 I will mainly be looking to use a 4-1-2-2-1 'V' formation so RM and LM's wont be needed. My initial formation, which I often like to play. Of course changes will likely be made, and squad roles/instructions will be assigned later on once I learn more about my players. As for the Druga HNL, we are predicted a mid-table 7th position out of 12 teams. However our odds aren't dreadful at 5-1, so who knows? Finances are pretty low, and the wage budget is already maxed out. No transfer kitty either, as to be expected I suppose. So after starting my previous English career, I got a little carried away and before I knew it I was around 5 years into the save and had forgot to update my story since the middle of the 2nd season. Oops. I now feel ready to actually start a proper career, outside of my comfort zone of the English divisions, in a country I have never managed in before (To start at least). Initially tour around Europe (Starting in-and-around Central/Eastern Europe) scooping up as many trophies and silverware as possible. 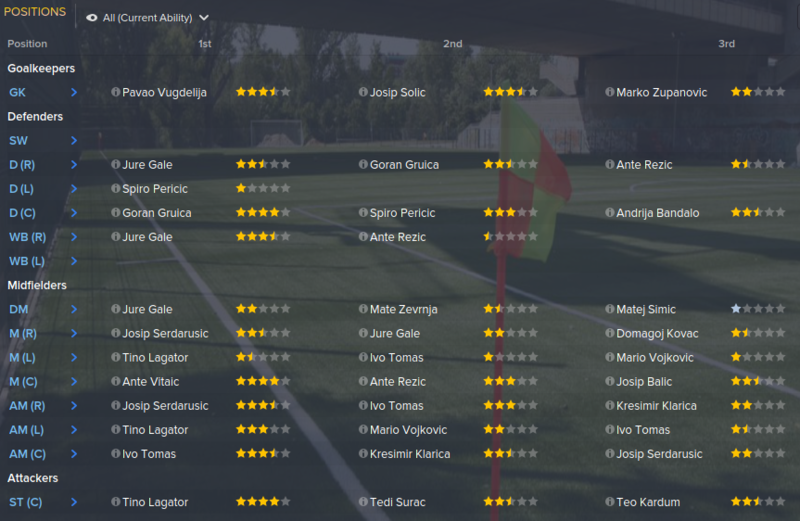 [Try to] Build a complete dynasty at said club, and sweep up as much silverware as possible. I did something vaguely similar in FM14 leading on from the Benfica challenge, and managed to go over 60 seasons, winning over 20 league titles and a fair few cup competitions too. 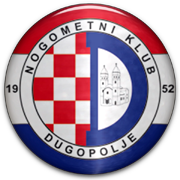 NK Dugopolje is a Croatian football club based in the town of Dugopolje on the outskirts of Split, a city on the Adriatic coast. They were founded in 1952, and they currently play in the Druga HNL, Croatian second level. Since 2009 Dugopolje host their home matches at the newly built Stadion Hrvatski vitezovi (English: Croatian Knights Stadium), which has a capacity of 5,200. The stadium meets strict UEFA standards and holds a licence for UEFA competitions. The 2009–10 season was a successful one for Dugopolje as they finished top of the 3. HNL South and were promoted to the Druga HNL. 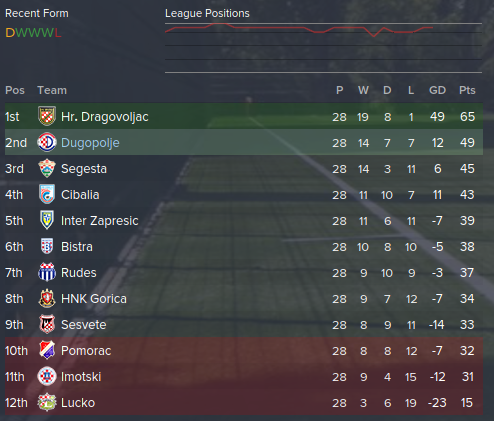 In their first season in the second division of Croatian football, Dugopolje finished in a respectable eighth position out of sixteen sides. In the following season, Dugopolje finished in first place, qualifying for promotion to the Prva HNL, the first division of football in Croatia, but were denied a licence for the top division due to numerous issues and remained in the second level. The 2012–13 season season witnessed a large restructuring of football in Croatia and that season, 7 out of 16 sides were to be relegated to accommodate for a reduction in the amount of sides in the 1st division from 16 to 12. 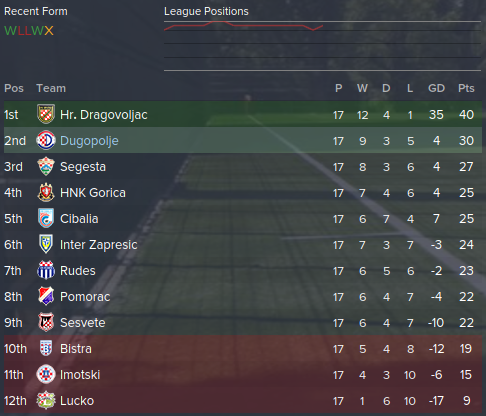 Dugopolje survived, finishing in 8th place, two places clear of relegation. In the 2013–14 season, with a reduced number of teams in the top and second division, the competition was much stronger than previous and Dugopolje struggled, finishing just outside of relegation. 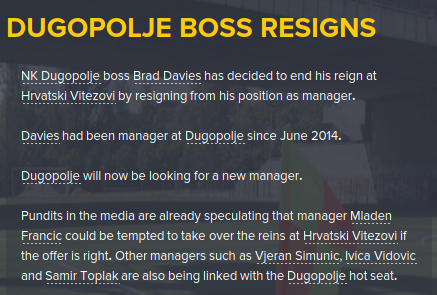 So I will be starting with Dugopolje in the 2. HNL, the 2nd division in the Croatian footballing pyramid. 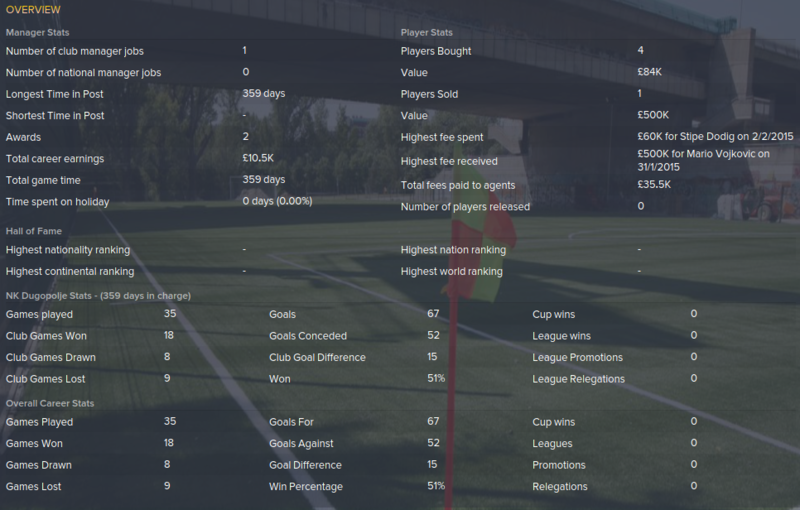 As soon as I take a good look at the squad and sort out some training, I will post a better summary of the club. Wow, that's pretty ambitious after only just getting promoted. Surely must mean your squad is up to it though? Great month Dan. 100% win record, 25 goals scored and just 4 conceded in a month is top notch. Good luck mate! 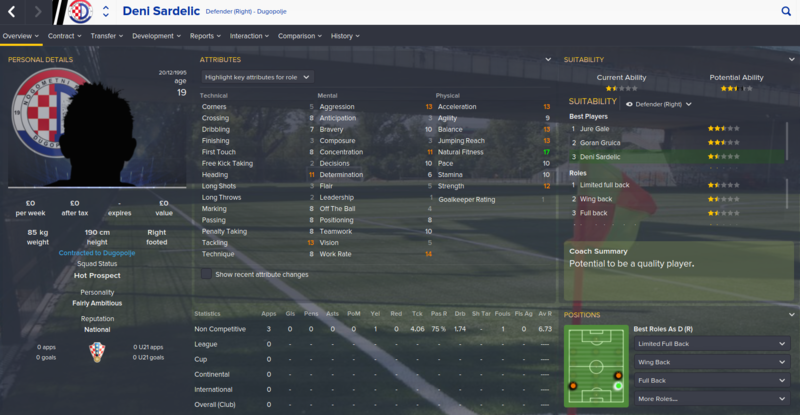 I remember spending a season or two at FC Helsingor back in FM13! You can do it, mate! Chin up and go get 'em! Wow, tough start, where do the board want you to finish, sure its only a matter of time before things come together! A win, a draw and two defeats this month. Pretty poor and there is talk of me possibly being under pressure. It's not going the way I had planned! We somehow moved up a spot to 14th though. I really need to start putting a run together to try and climb up the table.